**For hundreds of ways of bookmarking our site, please check this out. 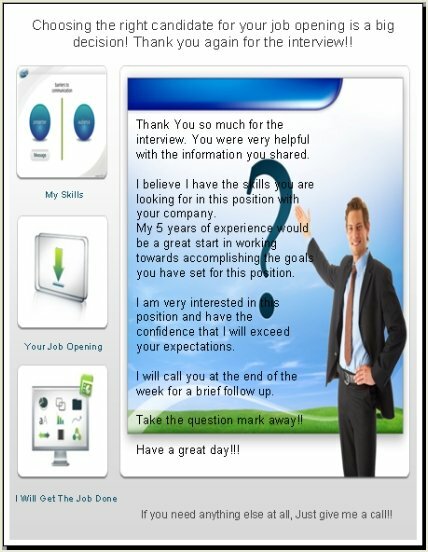 What is an after interview thank you letter template? This is a supplemental very helpful tool for you to use to create your own thank you letter. The template will clearly arrange the important format to use plus it gives you hints on what to add into your own thank you letter. Now I may have went overboard just a little bit when I created these two above for you to use. But if you are like me and just don't want to send the normal type of template, then why not get creative. I really think someone will make a lasting impression on the interviewer when they choose to use one of these above. The interviewer probably does not get to many thank letters anyway, so when they do get one of these memorable one's from you, they are bound to show them around the office with pride I would bet, for the sender. Which will be you. They might possibly call you right away after they get done reading it. Now the second one is a little tricky to edit. But really all you have to do is click in the text box where the question mark is and you will be able to edit it easily I am sure. The template already has the correct format for you to use. The template also gives you suggestions on what to add to your letter. The template lets you see what the final letter will look like before you even start to write. Good advice is to keep your letter to only one page. A template is explained as a pre-developed document or electronic document that will let you make more similar pages that look like the original with little effort on your part. This is perfect for you to use and really makes it easy for you to complete your thank you to the interviewer in no time at all. Not only does this template let your courtesy show through, it also gives you tips along the way to help highlight your skills and professionalism. Your Thank you letter could look something like the one below. 1. You can download both of these beauties above, then edit them using word!! Make your thank you letter brief and to the point. State clearly your sincere appreciation to this person for taking the time to meet or interview you. 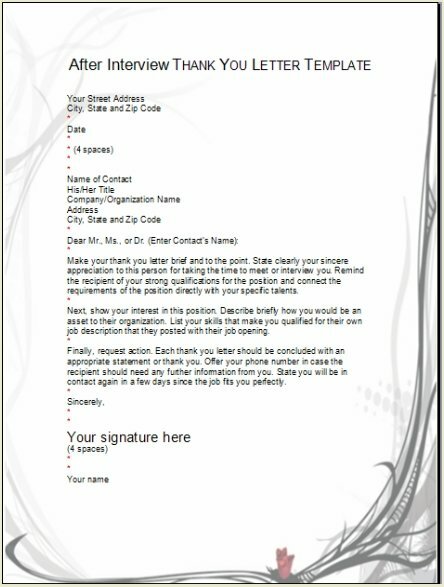 Remind the recipient of your strong qualifications for the position and connect the requirements of the position directly with your specific talents. Next, show your enthusiastic interest in this position. Then describe very briefly how you could assist their organization. 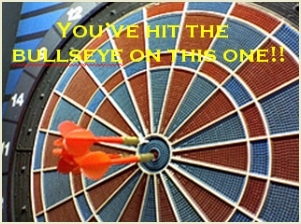 List your skills that make you qualified for their own job description that they posted with their job opening. Finally, request action. Your thank you letter will be concluded using a big thank you. List your personal phone number where you can be reached for any questions they may need answered. State you will be in contact again in a few days since the job fits you perfectly. Do you know using one of our thank you letter templates is very smart on your part, just because they are so easy to complete and already formatted correctly. So if you made a great enthusiastic impression during your interview, you could possibly triple your own chances of getting the job, by sending a thank you letter. Why you may ask? To be honest, most people do not send a letter after their interview. This is really a big mistake! Just think back awhile to when you got the last thank you letter from a friend? It made you feel great that someone actually took the time and effort to send it. How did opening it make you feel? Well believe me when I say, your interviewer will feel exactly the same way!! Link code to this page is provided below. Make friends happy! Share.